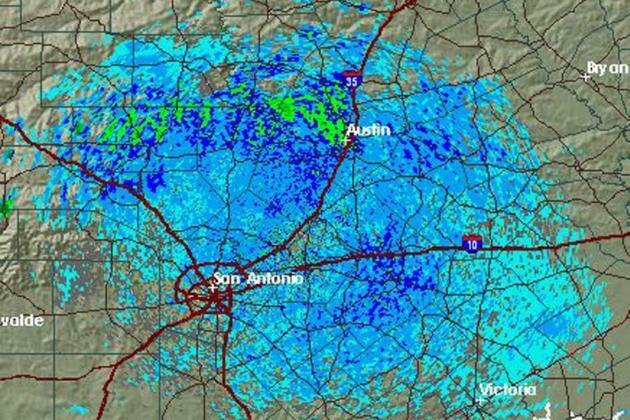 Forecasters in Texas thought something was wrong with their equipment late last week when radar showed a massive area of rain and strong storms stretching from Dallas to Austin on a dry summer day. “It looked like it was raining,” Jennifer Dunn, a meteorologist for the National Weather Service in Dallas-Fort Worth, told the Austin American-Statesman on Friday. “We thought something was wrong with the radar, but we checked our instruments and measurements. Everything was working fine." A screen shot from the National Oceanic and Atmospheric Administration showed what appeared to be large swath of storms in the area. But while temperatures in Austin hit a record 106 degrees on Friday, skies were clear, Dunn said. She suspected the radar was picking up bugs—like, a lot of bugs. But Pat McDonald, a meteorologist for the National Weather Service in New Braunfels, Texas, disagreed. “If it were just bugs, we’d be talking about the second coming of Christ,” McDonald said. Dust, pollen, humidity, "lady bugs, grasshoppers, bees and even a few birds," he said, were likely kicked up into the atmosphere by a weak cold front and showed up on radar as a storm field. "Not the apocalypse," McDonald said. The mass disappeared after early Friday evening as temperatures fell. And we probably won't see any apocalyptic air masses on the radar for a while. According to the National Weather Service, record or near-record low temperatures are expected across Central Texas through midweek.